Wilkes-Barre (United States) (AFP) - Lewd remarks about groping women? It's locker-room banter. Accusing former US president Bill Clinton of sexual abuse? He had to. Left for dust in the polls? Pollsters lie. Donald Trump's supporters appear oblivious to the gravity of his latest scandals and hemorrhaging support among lawmakers from his Republican Party, as passionate as ever about electing the real estate billionaire to the White House. 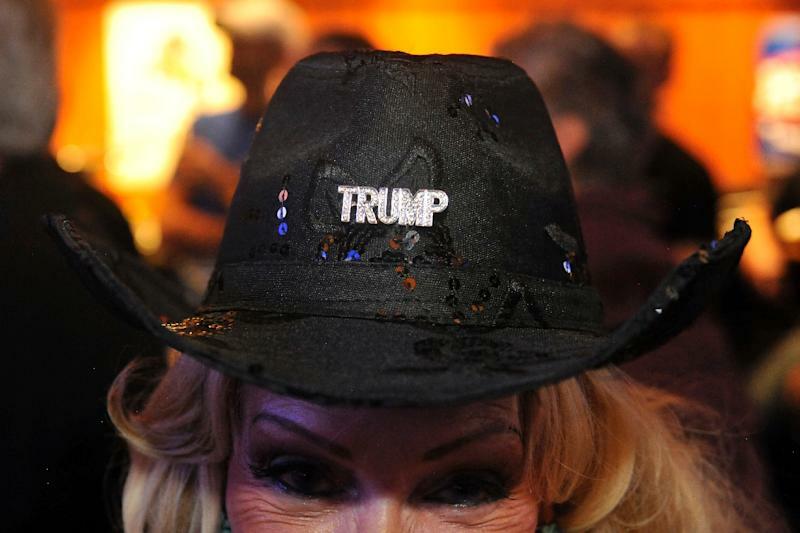 Trump may be repelling undecided voters, but if the Grand Old Party has all-but renounced hope of victory on November 8, there is little sign the former reality TV star's loyalists are abandoning him. "Trump! Trump!" chanted a crowd performing Mexican waves waiting at the Republican nominee's first evening rally since the latest scandal broke. They took over an arena in the former coal-mining town of Wilkes-Barre, run by a Democratic mayor in the swing state of Pennsylvania. Clinton is 9.4 points ahead in the state, according to a RealClearPolitics poll average. "I may be limping across that finish line, but we're going to get across," a rueful Trump said on Monday. Perhaps sensing their man needs them now more than ever, loyalists gave him a rock-star welcome, even if Clinton pulled in a campaign record of more than 10,000 supporters in the key neighboring state of Ohio. Trump's venue has a maximum capacity of 10,000. It was not quite full. A police officer said he expected 9,000 and that supporters started arriving at noon -- seven hours before the rally got underway. Those queuing outside said a 2005 tape of the candidate bragging about grabbing women by the crotch only shows he has the "rough and tumble" needed to stare down the likes of Russian leader Vladimir Putin. "It means nothing to me," said Lynae Kuntz, who has worked in health care for 30 years. She thought Democrat Bill Clinton was a good president and tolerated his infidelities -- so, too, with Trump. "That doesn't have anything to do with the presidency," she said. "Whatever he did, I don't like to judge people, I just want somebody who's going to make everything better for us in the United States." Democrats and undecideds don't agree. 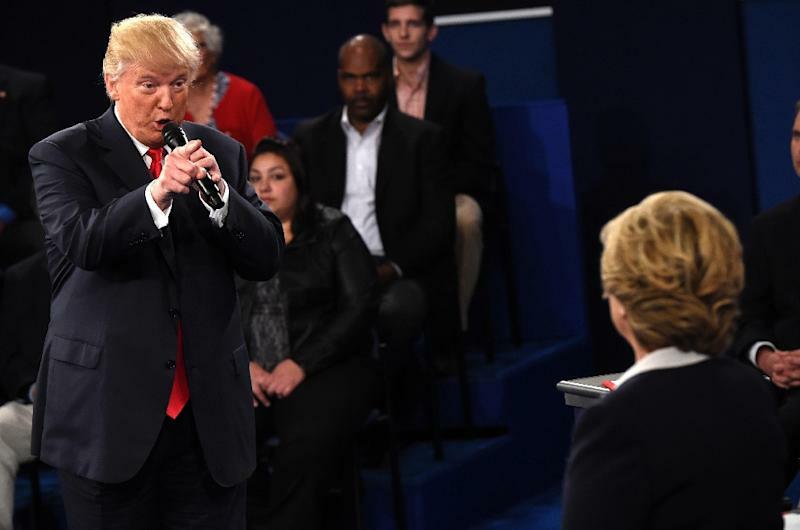 A recent NBC News-Wall Street Journal poll showed Clinton's lead up to double digits, with 41 percent of voters finding Trump's remarks "completely unacceptable." A recent Quinnipiac University survey showed women back Clinton 53-33 percent. But although Trump polls best among white, blue-collar men, there were still plenty of women and middle-class professionals in the crowd. His appeal as a political outsider, his promise to bring back jobs, end illegal immigration and defiance of political correctness have galvanized millions of Americans fed up with career politicians. They often overlook or excuse insults he has dished out -- against women, Mexicans, Muslims and the disabled -- in an aggressive, controversial campaign that has polarized the country. "We're really excited," said Kim Herron, 44, from Wyoming, Pennsylvania who works in marketing, as she stood in line with her fiance. 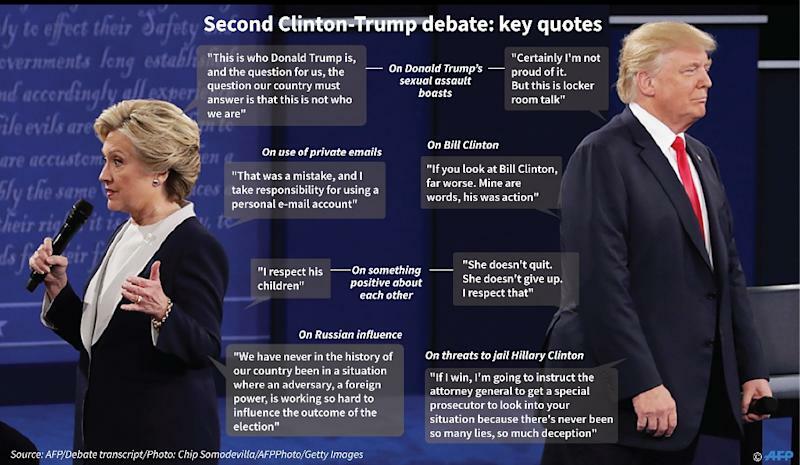 She admired Trump's performance in the debate, saying the highlight was his call to throw his rival in jail, and dismissing his lewd remarks as "nothing that any man or woman hasn't probably said." She defended his attacks against Bill Clinton -- whom Trump called "abusive" toward women during Sunday's debate -- as fair, considering he would be back in the White House as first spouse, which "wouldn't be good." Bev Rose, a housewife who moved to Pennsylvania with her husband last year after 13 years in Britain, said nothing could dissuade her from voting Trump in four weeks' time. But while his "bar banter" doesn't change her mind and she thought he scored valuable points in Sunday's debate against Clinton, she does worry that he might not make it all the way next month. "Anyone else in this line who did a fraction of what she (Hillary Clinton) did would be in jail right now, and she gets to go run for the White House," Rose said. "She should never be allowed." Her British husband Neil, a retired engineer dressed in a silk cravat and Barbour rain coat, said Trump had redefined Republicanism. "The GOP seems to be out of step," he said, just hours after the party's most senior elected official, House Speaker Paul Ryan, told fellow lawmakers he could no longer "defend" the nominee. "Look at the people here today, there's such a popular groundswell," he said, gesturing at the huge queue. "I'm just awestruck, it's amazing."